Running a good blog or content marketing strategy probably isn’t as hard as running a kingdom. Figuring out what your readers actually want from you can be done through surveys, monitoring website analytics and several other easily available tools. Research done by others in your niche or industry can be useful sources too. Today this information is ready available, unlike in the past when businesses kept most of their results under wraps for their own use. Simply keeping your eyes and ears open can simply your research process and give you all the information you need. Here’s a list of some of the most useful content marketing statistics and tips on how to implement them into your strategy. 1. Write longer posts. We’ve all heard the arguments about the perfect blog post length. Should they be as short as 300 words or taper out around 800 words? Neither. Blog posts should be way longer. According to serpIQ, the ideal length of a blog post is more than 2,000 words. serpIQ discovered that the average length of blog posts that appear in the top 10 search results is more than 2,000 words. In fact, the ones in the top two results have an average length of more than 2,450 words. In the above graph, you will notice a shrink in blog post length as they begin to sink down the search results. 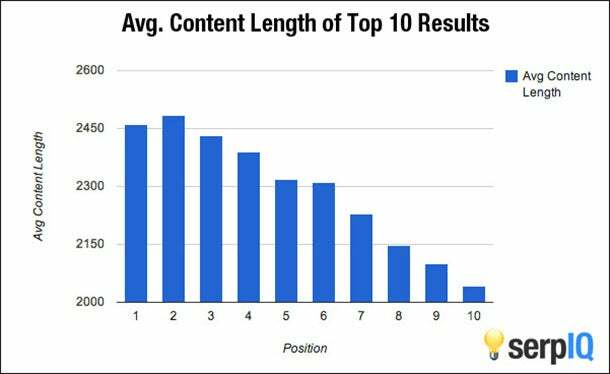 This phenomenon of blog posts ranking well because of length was explained in a study where SEO Moz analyzed the length of blog posts against the number of backlinks they receive in hope of finding an answer. Longer posts attract more backlinks. More backlinks are an important component of SEO and serve as catalysts, thrusting longer posts into the top search results. Longer posts can also be instrumental from a social-media point of view. 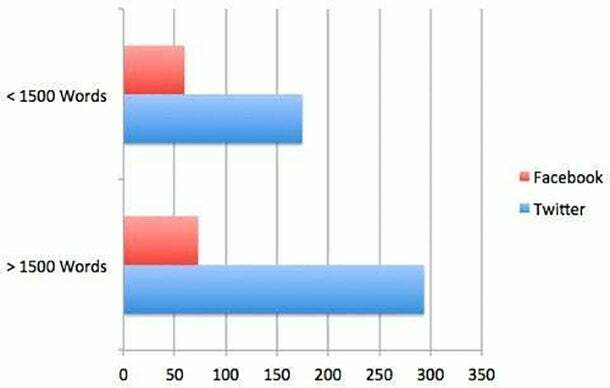 Neil Patel analyzed 327 blog posts on QuickSprout and divided them into two parts. One part had posts that were fewer than 1,500 words and the other with posts that were more than 1,500 words. He then analyzed how many Facebook likes and tweets they received. Posts longer than 1,500 words on average receive 68.1 percent more tweets and 22.6 percent more Facebook likes than posts that are shorter than 1,500 words. According to these studies, writing longer posts will help you gain traffic through both search engines and social media. This doesn’t give you liberty to beef up content just for the sake of it. People won’t share your article because it's long, they do it because it’s worthy of their time and attention. Ensure your long blog post has quality from the beginning to end, complete with subheads, bold text, visuals, no repetition, etc. For examples of well written long-form posts, check out The Four Hour Work Week and Viper Chill. 2. Use more visuals. In the 2014 Social Media Marketing Industry Report, Social Media Examiner discovered that 60 percent of marketers use content in the form of original visual assets (infographics, memes, etc.) in their marketing. The report also indicates that the content form most marketers (68 percent) want to learn about was creating original visual assets and that 70 percent of marketers plan on increasing their use of visual images. The rise of social media sites such as Pinterest, Instagram and Tumblr also contribute to the importance of including visuals in your content marketing mix. Pinterest has more than 70 million active users. Americans spend an average of one hour and 17 minutes each month on Pinterest and one hour and 38 minutes on Tumblr. The time spent on these two visual sites individually is more than the time spent on Google+, MySpace, Linkedin and Twitter combined. Right now, Instagram is the fastest growing social network. This shouldn’t come as a surprise, as 65 percent of people are visual learners, as reported by the Social Science Research Network. According to Zabisco, 90 percent of the information that reaches the brain is visual. This makes it essential to include visuals in your content-marketing mix. The SEO Moz study also found that content with only images attracted more backlinks that those with only videos and lists or those with a combination of videos, lists and images. 3. Create infographics. Hubspot found search volume for infographics on Google has increased by 800 percent, and that today’s infographic production is rising by 1 percent daily. Infographics can be a great way to quench your visual learners’ needs. Ensure that you create quality infographics with graphs, illustrations and numbers and very little text that appeal to your visual learners. The best option would be to hire firms or designers to create them. But if you are on a tight budget you could learn how to easily create them with PowerPoint. Other visual content you could look into using are slides, comics and memes. Slides can be easily created by using SlideShare, which gets 60 million visitors per month. Comics can also be a great source for traffic as humor is highly shareable, according to Jonah Berger. Memes too are a form of humor, but beware of breaking copyright laws when you share them. 4. Record podcasts. What benefit can podcasts offer visitors that text, visuals and videos don’t? They don't require full attention. When you are reading a blog post, infographic or watching a video, your eyes have to stay on the screen. But you can listen to a podcast while going about your normal daily routine. This could point to the increasing demand for podcasts. According to the 2014 Social Media Marketing Industry Report by Social Media Examiner, only 6 percent of marketers are currently involved in podcasts, while 21 percent plan on getting involved this year. Despite the potential for big audience gains, running a podcast requires a huge effort. It takes research, equipment, building your network, guest outreach, preparing questions and submitting it to various directories such as iTunes. Check-out this tutorial for help getting started. Audiences and markets will continue to evolve, and so will their content needs. It's not enough to simply create great content anymore, it needs to reflect the current trends and preferences to make an impact and build your brand. Seeing Red? Keep This In Mind When Choosing Marketing Colors.